The brief, contentious engagement of Amazon and New York City ended abruptly this week, with Amazon deciding that its choice of New York as a site for a new headquarters was not right after all, and that what the company had wanted—“positive, collaborative relationships with state and local elected officials who will be supportive over the long-term”—wasn’t in the cards. With the rise of anti-plutocratic populism, Amazon is the first major casualty of what is sure to be an escalating conflict. Its decision to terminate its planned expansion in the Queens neighborhood of Long Island City will be bad for New York City, bad for Amazon, and not so great for a national economic system that will need all of the investment and innovation it can get in the years ahead. Everyone will survive, but this surge of economic NIMBY-ism will make no one richer, no one more economically secure, and will not advance the vital cause of expanding opportunities and meeting the needs of neighborhoods and communities that require more—and not less—investment. As many have now noted, Amazon should have been prepared for the rough-and-tumble world of New York politics, and the company was not. In New York, nothing is easy when it comes to cobbling together constituencies that speak with the cacophony of many voices. Brad Stone, one of the leading Amazon watchers, observed that in deciding not to engage in the nitty-gritty of city politics, Amazon’s CEO, Jeff Bezos, did what he always does when faced with resistance—by “belligerently confronting opposition he views as unfair or unjust.” Rather than wooing New York, Bezos responded with an all too New York F-you. Predictably, immediate reactions ranged from the ebullient to the despondent, the hopeful to the angry. Mayor Bill de Blasio sounded hurt and angry, and accused the company of “throwing away a great opportunity.” Governor Andrew Cuomo slammed Democratic leaders in the city for “the lost economic opportunity.” Meanwhile, AOC celebrated, as did senator Elizabeth Warren from her new perch as presidential candidate. 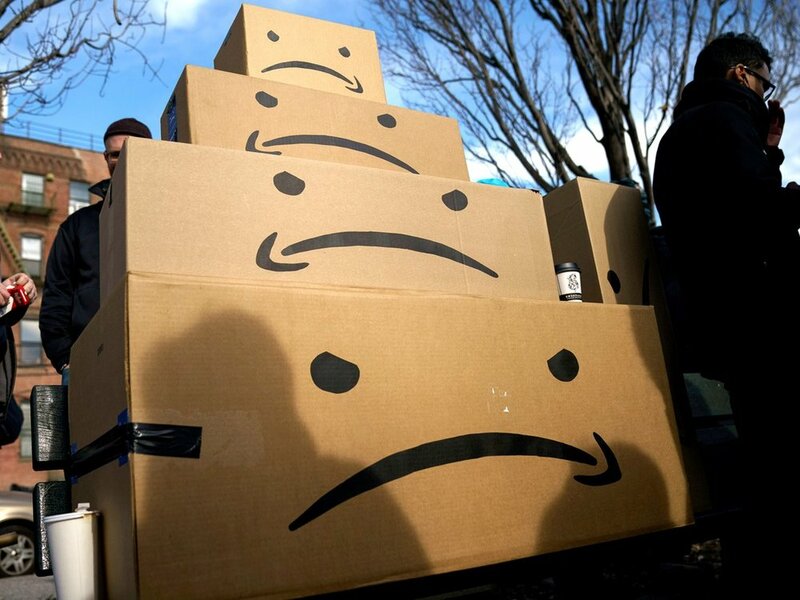 Some in the media, such as The Atlantic’s Derek Thompson, said that it was entirely right for New Yorkers to be outraged at Amazon’s plans and for the company to withdraw. The opposition was primarily to a package of nearly $3 billion in tax breaks and incentives that Amazon stood to reap for relocating and hiring a planned 25,000 people at its new site. That and assorted concerns about Amazon’s widespread use of minimally paid fulfillment center workers. But it was the incentives that became a lightning rod. That issue, however, is misunderstood, and it cost Amazon and the city of New York dearly. Amazon was not given a special $3 billion in backroom deals as an incentive for choosing New York. Amazon qualified for more than $1.2 billion in state incentives, and nearly $1 billion in New York City tax incentives, but neither of those programs were specific to Amazon. The state incentives and tax breaks are part of a longstanding Excelsior Jobs Program that offers such benefits formulaically to any company creating jobs in the state; the city incentives would go to any company relocating to the city. Those programs were in place before Amazon, and were not developed to woo it. That is why it is so misleading to characterize the incentives and tax breaks as a juicy package secretly concocted in Albany and New York City to pitch Amazon. Mind you, there may be a strong argument against giving state and city incentives to large companies, especially flush companies like Amazon, which have no pressing need of more. Eliminating subsidies, however, would require opponents to engage in a complicated debate about where tax revenues come from and how to ensure creation of higher-paying jobs, which is why those programs exist in the first place. Most estimates of the long-term tax revenue from higher-paid Amazon employees were many times the $3 billion in subsidies, not to mention the critical mass of new jobs and development centered in an area of Queens that has lagged behind western parts of Brooklyn and Manhattan. New York has long depended on the financial services industry, as well as on the city’s allure for foreign wealth looking for real estate. Amazon would have represented a potential next wave for the city, which is already becoming a vibrant tech hub rivaling Silicon Valley, though with many of the same issues of high cost and high salary. Amazon’s decision not to go ahead with a new headquarters (it will still have thousands of employees in the city) is a blow to a more diverse economic future, as well as one that is less Manhattan-centric, which has been a goal of progressives for many years. And given the necessity of investment in local education, transportation, and safety nets, a robust company creating more higher-paying jobs than, say, Walmart is among the best ways to increase the tax base for precisely those goals. The decision, however, is also a loss for Amazon. Years from now, Bezos may look back wistfully at a time when all he had to contend with was a fractious New York City political landscape, one he could have met with more promises to invest, some collective bargaining, and perhaps a refusal to take full advantage of New York’s preexisting incentives. As rising populism places both billionaires and mega-tech companies in an unfriendly spotlight, Amazon’s refusal to engage its opponents and address legitimate concerns head on suggests that it, like most tech behemoths, remains unprepared for a storm of regulation, antitrust questions, and public distrust built of animus to everything from privacy issues to wealth concentration. What lies ahead could make the hostility of some New Yorkers look quaint and civil by comparison. Amazon had a chance to set a new template for how it engages, and diffuses, its opponents and critics, and to show it understands that a corporation’s social license to operate, once lost, takes years of effort and massive spending to reclaim. Walmart, which was the corporate bogeyman of the 1990s, learned that lesson, but it took years of investing in higher wages, communities, and a commitment to sustainability to make that shift. Amazon is setting itself up for a similar backlash. And in the sorry end to this tale, it’s hard not to see the American economy as a casualty. Zero-sum contests between populists and big companies will engage passions on the left and the right, but the result will be more distrust and less investment, more energy expended in a fight no one can fully win at the expense of needed action in the present. The best case scenario here is that other companies and other localities recognize that, and make more of an effort to meet on common ground. New York, at least, is better able to weather this loss than many others, but it would be foolish to think that such advantages will last forever. The same is true for Amazon. Two of the more vibrant loci of the United States today have, for the moment, each managed to produce a self-inflicted wound. Let’s hope that other communities and companies take note and learn from this mistake.